The Holiday Season is fast approaching….Christmas is just 77 days away! For the second year in a row, EOR will be providing “Gifts of Hope” for orphan and vulnerable children in Ethiopia. In mid November a team from EOR will be traveling to Ethiopia to meet with our partners, check on projects and assess future needs. While there we will be purchasing chickens, goats, cows to share with our partners. If you would like to buy an early holiday gift please let us know. We will send to you a card you can pass along to the friend, teacher, co-worker who you could honor. We will also send photos to you in early December of the children receiving the gifts of hope. To purchase a gift of hope click here. 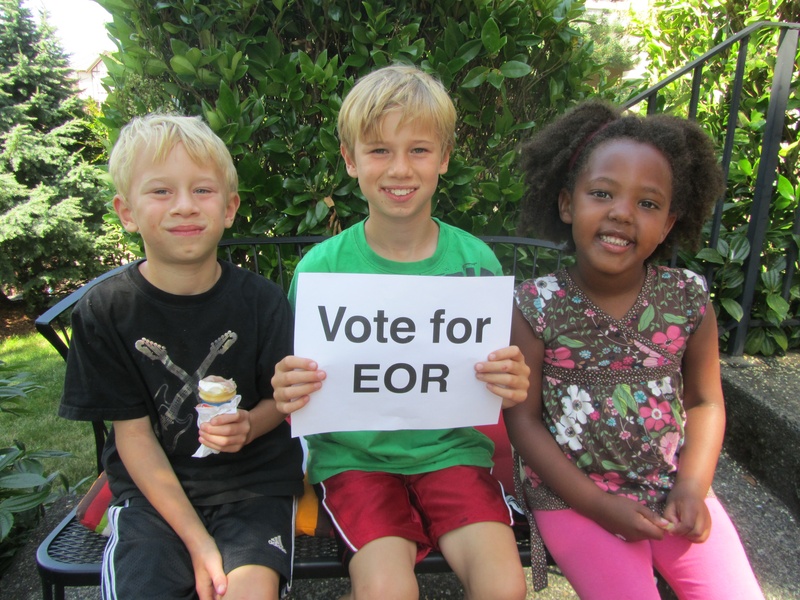 Here at EOR, we don’t like to toot our own horns, but today we have good reason to do so. Ethiopian Orphan Relief, Inc. is a proud qualifier for a Classy Award! “Hollywood has Oscar, Broadway has Tony, and now philanthropy has the Classy.”-October 2010 The CLASSY Awards recognize the top philanthropic achievements by charities, businesses, fundraisers and volunteers from across the country. The winners receive national exposure and more than $150,000 in cash & prizes for their cause. Ethiopian Orphan Relief, Inc. launched the Project Gena 2010 campaign in September of 2010 through various social media platforms. 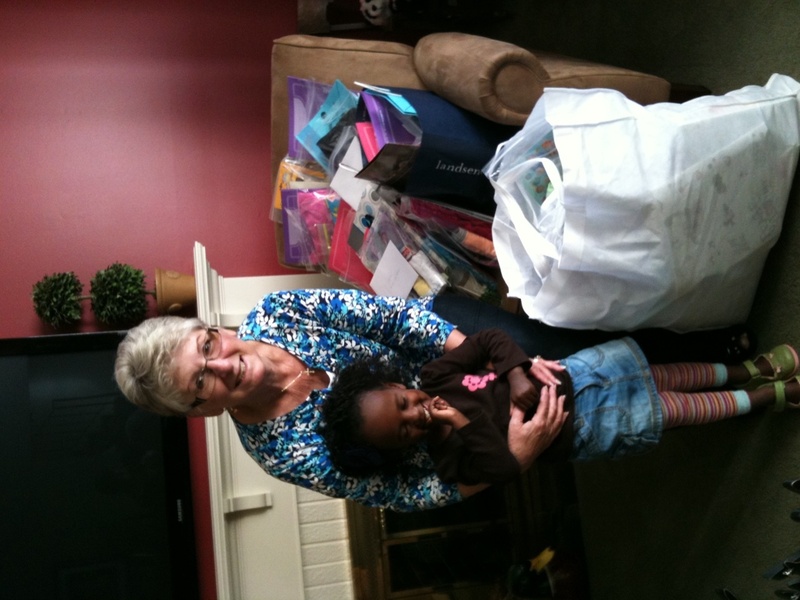 Supporters were asked to make Christmas merry for a child in Ethiopia by filling a backpack. In a 3 month window, 156 backpacks were stuffed and shipped to the orphans of Children’s Heaven and Friends of Orphans and Vulnerable Children (two of the 5 orphan care centers EOR serves). While the primary goal of Ethiopian Orphan Relief is to to ensure that every child in Ethiopia has a warm bed, a loving influence, and sufficient education to better their lives. EOR’s focus on infrastructure (facilities, meal programs, health clinics, etc) sometimes makes it difficult for donors to feel connected to the orphans we serve. Sending backpacks filled with toys, clothes, school supplies, and letters gave donors an opportunity to connect with the children in a very immediate way. While the logistics of transporting the backpacks to Ethiopia (no direct shipping means that we rely on travelers to bring our donations to Ethiopia) made it impossible to send backpacks to every orphan care center we serve, there was no end to the support and enthusiasm for this project. Ethiopian Orphan Relief, like Edmund Burke, believes, “Nobody made a greater mistake than one who did nothing because he could do little.” Project Gena 2010 made it possible for even small-scale donors to make an impact, and as a result, these donors felt more invested in the work of Ethiopian Orphan Relief, increasing the likelihood that they would give again during the year. We kick off Project Gena 2011 in August of this year. It will be annual event, bringing joy to people on 2 continents. Ethiopian Orphan Relief, Inc. appreciates all of its donors, both big and small. Every gift is a generous one, no matter the size. Our entry can be seen HERE. 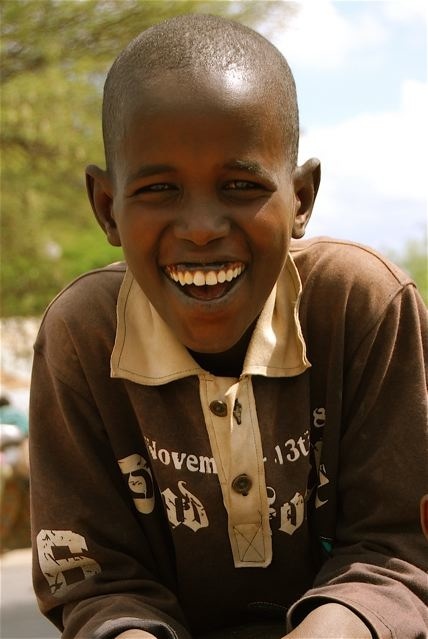 Please, please click like next to the Ethiopian Orphan Relief headline to help us stay CLASSY! So at this time of year, Halloween has ended and Christmas has entered the stores. Thus, my children are sure that Christmas is only two seconds away, and the list making commences. Some of my more industrious children began their lists in July and one in particular has created something that can only be referred to as a manifesto. Here is my four year old’s list, as dictated to his father. My husband said that the maniacal laughter at that point took over the discussion. At my house, the children get something to play with, something to wear, and something to read and then a big communal gift from Santa. This year, we will be adding stockings from Project Gena as their gift to others. What are your holiday plans? Wow! Just last month EOR kicked off our Project Gena idea and you our friends took the idea and shopped it. Were happy to share we are half way there! You have graciously filled a total of 74 backpacks for children at FOVC & Children’s Heaven in Ethiopia. We have 56 more to go. Can you help? Boy or girl? email kim@ethiopianorphanrelief.org to make plans to shop for a specific child. To busy to shop? For a donation of $15.00 we’ll shop for you and send a special cards to the honoree of your choice. Maybe do a backpack in honor of a family member, perfect gift for the girlfriend who has everything, the post carrier, a perfect birthday gift. To see a video of Project Gena click here. their family from the Toukoul Orphanage in Addis Ababa, Ethiopia. Last week Danielle dropped off gifts for 25 backpacks. My living room now looks like Santa’s village. Danielle shared that she & her husband usually do a giving tree each holiday. When they learned about Project Gena they wanted to help the children from their grandson’s homeland. She also enclosed a hand written note to each of the 25 children. It brought tears to my eyes to see so much love. Thank you Danielle for your giving heart. When shopping for your treasures please take photos and send to us. We will be highlighting you the month of November. Thanks again to everyone who’s helping us with the project. Christmas in Ethiopia is called Gena and it’s celebrated on January 7th. Here at Ethiopian Orphan Relief we’re gathering gifts to put in backpacks for children of Children’s Heaven & FOVC (Friends of Orphans & Vulnerable Children). Through “ProjectGena2010” your generosity will brighten an orphan’s life. EOR provides the backpacks~~ can you help us fill them? Boy or girl? 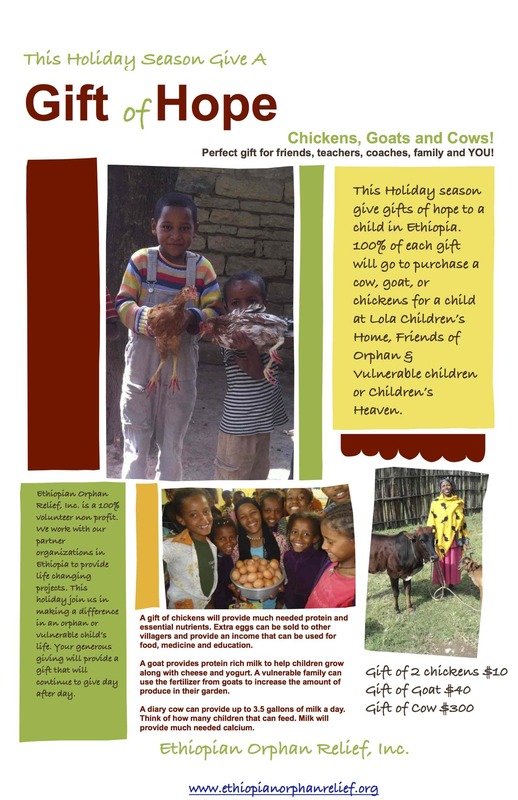 Email kim@ethiopianorphanrelief.org to make plans to shop for a specific child. Too busy to shop for all the special someones on your personal gift list? 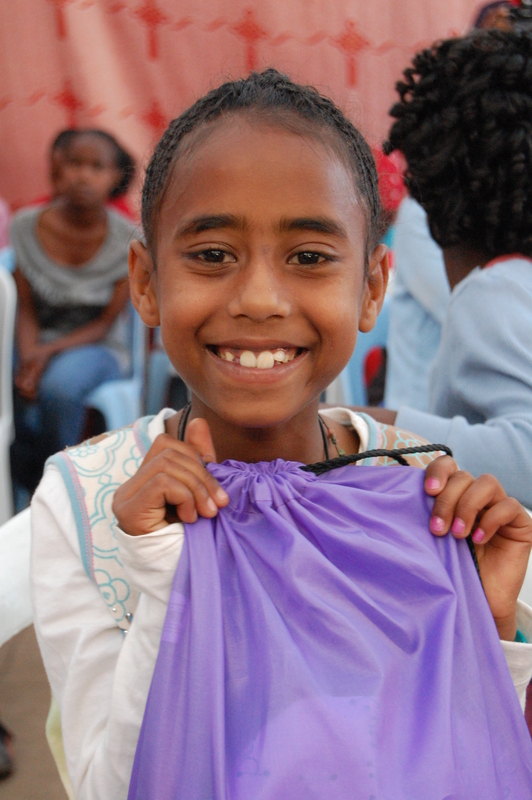 A backpack for an Ethiopian child makes a wonderful gift for others. For a donation of 15.00 we’ll shop for you AND send a special card to the honoree of your choice. A personalized letter or photo makes a wonderful addition to any backpack – we welcome yours. We can’t wait to share a photo of the children receiving their gifts, please include your address with your donation so we can send you one too. To see a video of Project Gena click here. Toothbrushes, socks, underwear, small toys, pencils, hair do dad’s, small cars, yo-yo’s, jump ropes, etch a sketch, markers, journals. Please contact kim@ethiopianorphanrelief.org for questions and address on where to ship your treasures.